She found the fabric at the fabric store. I corrected some of the fitting issues from her leading strings gown. It's a striped cotton in purple, which she chose to reflect the young Disney princess Sofia the First. Since it's a fine stripe, I made it 1780s style so it ties closed in the back. Photos of its debut are below with a few explanations; construction notes are coming soon. Admiring her new "colonial" shoes on Duke of Gloucester Street. Exploring the Governor's Palace garden. She had to have a sash. Thanks to the coral sash on her leading strings gown, and the sash on a flower girl dress she recently wore, we're really into sashes. This one is just a shinny purple ribbon that I had in my stash. Check out that nicely sewn sleeve! 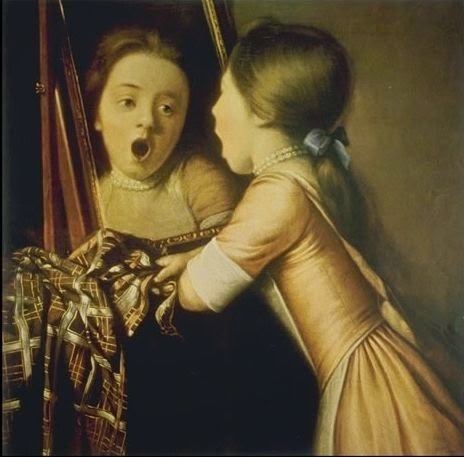 ...the 18th century painting Young Girl Singing into a Mirror. She loved the garden's mazes. ...and pretending to be a statue. Standing at the spot where her dad popped the question over ten years ago. Making a "history friend" with one of Williamburg's interpreters. This gown fits her perfectly so there's not much room for growing. I doubt we can use it next year, but having a few colonial dresses to wear in the historic area helped positively shape her experience in Colonial Williamsburg. Wearing the "history dress" made her an engaged and enthusiastic visitor, much more so than visiting in modern clothes. Nurturing cultural interests and fostering positive museum experiences are well worth the effort for some extra fabric shopping and sewing. Absolutely aDORable!!! Gorgeous pix of a gorgeous little lady. How adorable! I love the purple stripes. My nieces love Sofia too. My 5 year old niece and I decorated our straw hats Victorian style for a girl/doll garden party. She loved her "grand lady" hat and wants to wear my old pioneer dress when she's bigger. Pefect! She has good taste in fabric and her joy comes across in the photos. So lovely. She's growing so fast! The stitching looks lovely, and it does look like it added ot the fun of visiting Colonial Williamsburg.